J.Crew offer their own view on the wall wardrobe essentials. J.Crew is a great source of various sweaters, cardigans, and stylish blazers so it’s a great way of building up basic wardrobe with it. The first thing on the essentials list from J.Crew is the Tippi sweater in soft merino available in fifteen different colors and hues. This is a great way to warm up your office look. 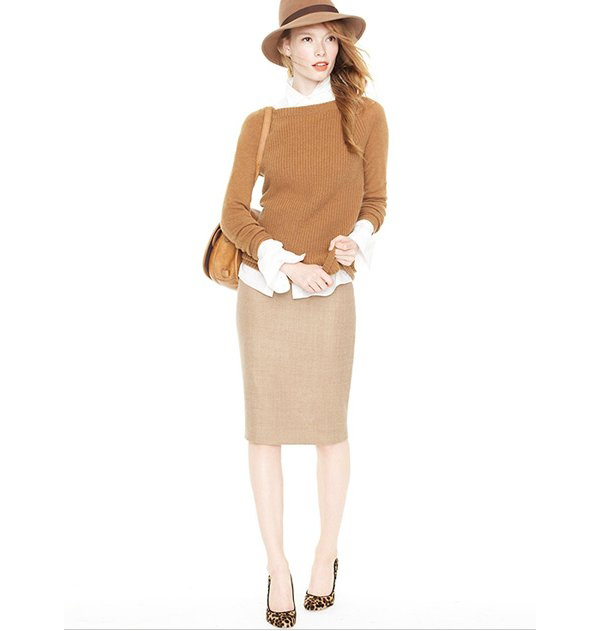 Wear the Tippi sweater over the white shirt or any blouse to achieve a warm sophisticated look. A woolen pencil skirt is another style staple during Fall. How esle a sophisticated silhouette to withstand the cold weathers? Though if the weather is not really a problem for you opt for a printed pencil skirt to spruce up the Fall wardrobe, we say. Outerwear, of course, is another thing to add to the Fall wardrobe. The J.Crew’s double-breasted navy design was made of exclusive fabric by Nello Gori mill from Itally. What a cool way to bring in a bit of military style to the picture. Available in five different colors the Biennial Hobo bag is both sleek and roomy. There are different compartments and pockets on the inside. Thanks to a double handle it can be worn as a shoulder bag or carried as a handbag. Café Capri are trendy cropped pants made in wool in five different colors for customers of different height. These are simply stylish and practical and can be worn casually or paired with an elegant blouse to suit the office dress code. There is no weather-appropriate footwear on the list but we think something around the ankle boots with a small chunky heel or high top sneakers. What about your Fall wardrobe essentials?